Carolyn Yohn of Untangled Translations in Granite Bay, California and Dr. Ivy Dykman, Adjunct Professor of French at the University of North Carolina-Asheville, will work together on the English translation, which is expected to be finished in August. Ms Yohn and Dr. Dyckman's translation of Monsieur Vaugelade's work will be the first comprehensive summary of the duc de la Rochefoucauld's North American "voyage" printed in English since the duc’s journals were first published in 1799. 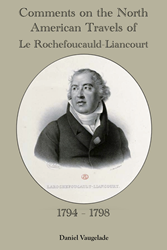 Tocqueville scholar Hugh Brogan, Professor Emeritus, University of Essex Colchester, United Kingdom will provide a foreword that places la Rochefoucauld’s massive work in the context of the duc's time. Duke Alexandre François de La Rochefoucauld-Liancourt fled France at the time of its September Massacres in 1792. He made his way from England to America, where he remained five years. During his self-imposed exile, the duke traveled from “le Haute-Canada” above Lake Ontario to Charleston, South Carolina. He returned to France following the coup of 18 Brumaire in 1799, which marked the beginning of the French Consulate and reign of Napoleon.